I am a big fan of prepared horseradish and it's an ingredient I keep on hand to add some kick in various recipes or to use as an accompaniment to meat dishes. 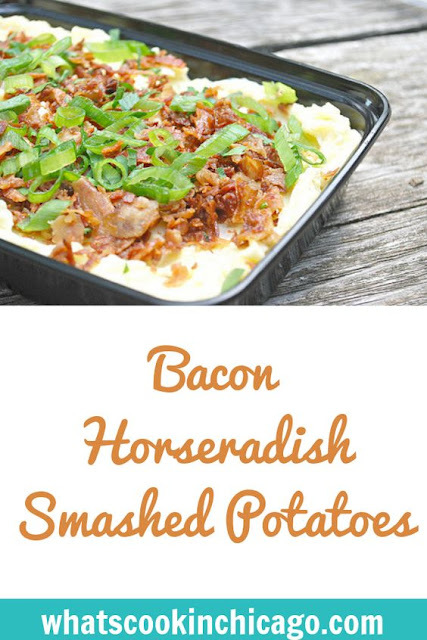 Bacon and horseradish pair really well together and when I saw the original recipe, I knew this would be a good potato salad to try. Joel prefers mashed potatoes over potato salad, which is why I prepared this as a smashed dish. But do try the potato salad version - it's delicious too! Either way, smashed or cubed, the recipe works for both. Place potatoes in a large pot and add cold water to an inch above the potatoes. Stir in 1 tablespoon of salt. Cover and bring to a boil. Cook potatoes for 15-20 minutes and test for doneness - a sharp knife should easily go through the potatoes. Drain the potatoes and transfer them into a large bowl. Add the vinegar and cover with plastic wrap. 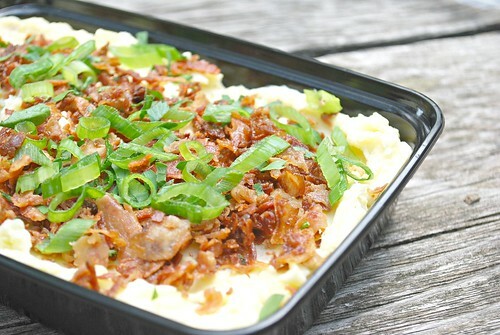 Remove potatoes from the refrigerator and add half of the green onion, half of the crumbled bacon, mayonnaise, and 1 tablespoon of horseradish. With a potato masher, mash the potatoes and additional ingredients together until fully incorporated. Season with salt and pepper to taste, adding more horseradish to your preferred taste. Garnish with remaining green onions and bacon before serving. omg I must save this recipe!!!! it looks sooooo good! Oh wow, that does looks sooo yummy - thanks! My husband would LOVE this, he LOVES horseradish! Thanks. That looks delicious. It looks like a perfect thanksgiving or other holiday/get together dish. This looks really good. I love horseradish chip dip, so I think I would love this. Thanks for sharing. I can't handle horseradish, but the husband loves it like its candy! He would be in heaven with these mashed potatoes! Growing up potatoes were a staple in my family. I don't use them as much now, but I really should. mmm I wish I had some of those right now for lunch. Yum! My family is potato happy so I am going to have to try this recipe. Oh man, this look so darned good! I wish you had a pin it button because I want to pin this to my recipe board so badly! Yummy! I think I would try this recipe on weekend, thanks for sharing.